With the purchase of a Jewish synagogue at 1881 Bush Street through the efforts of Reverend Hosen Isobe and Japanese American volunteers, Soto Mission of San Francisco, Sokoji, was founded and dedicated on December 8, 1934 (the date of the Jodoe - Buddha's attaining enlightenment). In 1942 Sokoji closed its doors due to World War II, but managed to continue making payments towards the purchase of the building by congregation members while being interned at various U.S. relocation camps. After World War II in 1948, the Temple re-opened for services by Reverend Rien Takahashi. 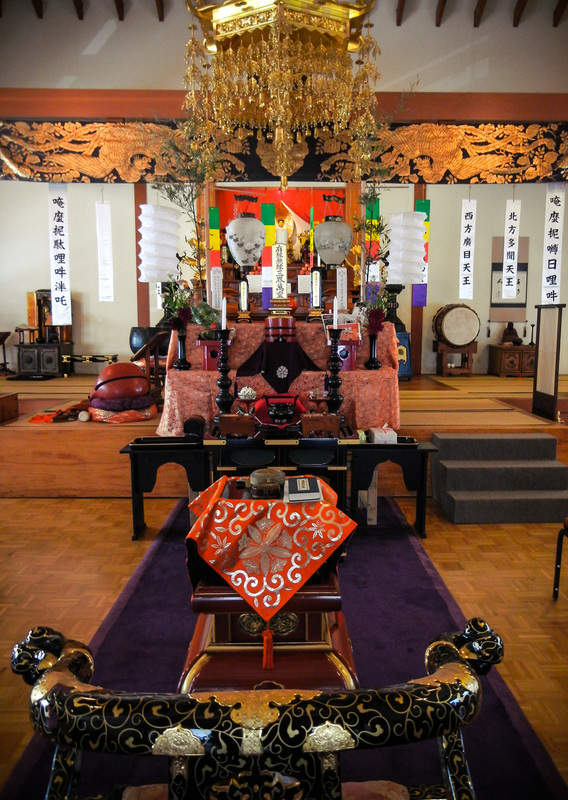 Once again through the strong support from congregation members, Sokoji was relocated to its current location at 1691 Laguna Street in 1984 after four years of construction. The temple reflects a Japanese architectural style, both in the interior and the exterior. Sokoji has continued to be a place for not only the Japanese American community but for all people of different backgrounds to practice their Soto Zen beliefs and Zazen (Zen meditation). Many temples in Japan have a similar open door policy where guests are free to enter at any time. It allows a casual or curious guest make an unannounced visit to a temple feel welcome where they are often treated to a cup of tea or an informal chat with the resident priest. Guests also visit temples to seek advice or to simply share an experience, and often bear gifts from their travels. This is the way in which my home temple has warmly received guests so when I arrived at Sokoji, it was a big culture shock for me to see that the front door to the temple not only remained locked throughout the day, but was also alarmed with a security system and camera. I now understand that the door needs to remain locked for security reasons, but I also know that it does not mean that we cannot open our mind and heart to welcome people to the temple. Thus when we have these feelings, our gate remains open at any time similar to the temples of Japan. There is a saying born from the teaching of Japanese tea ceremony called “ichi-go ichi-e”. It has often been translated to mean a once in a lifetime chance in English. It also means that we should not neglect or ignore anything that happens in our lives, and that we should do our best to cherish each and every moment as we will never be able to repeat it again. This is also one of the most important aspects of Zen training. So when you find yourself near our temple, please do not hesitate to ring the bell and have a cup of tea with a casual chat of “ichi-go ichi-e”.